The number of people facing starvation in Yemen could rise to nearly 12 million as conflict intensifies around the port of Hodeidah, a vital aid delivery link. A collapsing currency and deteriorating economic situation in the Middle East&apos;s poorest country are also aggravating the situation, the World Food Programme told CNN Monday. The WFP said 18 million people in Yemen already do not know where their next meal is coming from and eight million of those are "considered on the brink of famine." "Since June, some 570,000 households have had to flee their homes from fighting in Hodeidah, while the Yemeni riyal has undergone an alarming depreciation, and the cost of basic food items has gone up by a third since this time last year," WFP Yemen country director Stephen Anderson told CNN. "If this situation persists, we could see an additional 3.5 million severely insecure Yemenis, or nearly 12 million in total, who urgently require regular food assistance to prevent them from slipping into famine-like conditions," he said. Earlier Monday, the UN&apos;s Humanitarian Coordinator in Yemen, Lisa Grande, told the BBC that unless the hostilities stop, Yemen would witness the worst famine the world has known for 100 years. Hodeidah, with its key port installations that bring in UN and other humanitarian aid, has become the centre of the conflict in Yemen between Arab allies led by Saudi Arabia and Houthi rebels backed by Iran. Ground troops allied to the Saudi coalition are trying to drive out the rebels controlling the city. 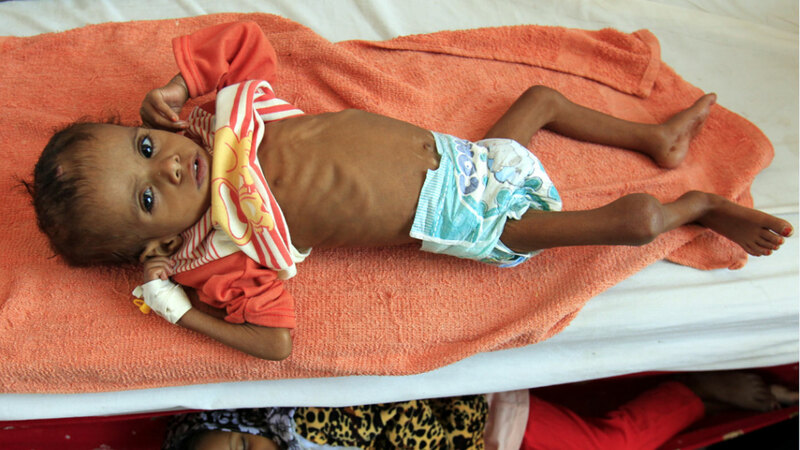 "Civilians in Yemen are not starving, they are being starved. Let it be known that the worst famine on our watch is wholly man-made by Yemen&apos;s local conflict parties and their international sponsors," Jan Egeland, secretary general of the Norwegian Refugee Council, said in a statement. "Yemen has long been bombarded with air strikes and subjected to strangling tactics of war. Mass starvation is a deadly by-product of actions taken by warring parties and the Western nations propping them up. The way the war is waged has systematically choked civilians by making less food available and affordable to millions of people," he said. WFP&apos;s Anderson told CNN that conflict around Hodeidah is currently blocking the aid group&apos;s access to wheat stocks there. "Due to the highly volatile security situation in Hodeidah city, WFP does not have access to its 51,000 tons of wheat stocks at the critical Red Sea Mills facility, which is sufficient to feed 3.7 million of the hungriest people in northern and central Yemen for one month," Anderson said. "We are doing everything we can to ensure access to these wheat stocks." CNN has been able to prove that weapons supplied to the Saudi-led coalition by the US have been killing children in Yemen. A spokeswoman for the Pentagon told CNN last month that "the final decisions on the conduct of operations in the campaign are made by the members of the Saudi-led coalition, not the United States." The Saudi-led coalition said its targeting operations in Yemen resembled the "highest international standards" and pledged to investigate the incidents uncovered by CNN. UK charity Save the Children said last week that five million children in Yemen face famine and the average child there has already witnessed a staggering 18,000 airstrikes. The NRC&apos;s Egeland said in order to avoid widespread famine in Yemen, the US, the UK, France and Iran must call for an immediate ceasefire and warring factions need to come to the table and agree on a peace deal. He also called for measures to rapidly revive Yemen&apos;s economy and allow the free flow of goods and aid into and across the country.